With Sniper Ghost Warrior 3 just around the corner let's get everyone up to speed on the story of the previous games. Here is what you need to know about the plot of Sniper Ghost Warrior 2. Players take control of U.S. Marine Captain Cole Anderson who is sent on a mission to the Philippines with his teammate Agent Diaz. Their mission is simple, they need to make their way to an old Russian radar post and destroy it whilst monitoring a deal going between some Mercenaries for a bio-agent WMD. Just before Diaz destroys the Radio Tower, he picks up some radio chatter about a PSC spy that has been taken captive by a mercenary group who commands this radio tower. Diaz then leads the team on a spontaneous rescue mission with Cole Anderson proving most of the covering fire. Cole soon discovered that one of the mercenaries is Merinov, and old acquaintance from a previous mission, and the bio-weapons is also a set up and the whole of Cole’s team is ambushed and killed or captured. Cole Anderson is the only one who manages to escape. Anderson then heads to the bio-weapon interception point but instead of following his primary objective of securing the bioweapons he saves Diaz instead, and the two of them manage to escape from the mercenaries. When Diaz and Anderson get back to base, Anderson is punished for disobeying direct orders and sent to the Brig. Whilst in the Brig, he flashes back to the events of his mission with Carl Maddox where the two of them were tasked with taking pictures of the genocide of Serbian forces led by Marko Vladić in Sarajevo, 1993. They meet a Russian contact by the name of Merinov inside the city of Sarajevo and secure a strategic point in order to take the pictures they need. Over the course of the mission, Maddox can’t take what he is seeing anymore and goes against orders to kill Marko Vladić. Anderson follows Maddox and Merinov takes them to a perfect vantage point in order to get the kill shot on Vladić. Maddo gets the kill shot and the both Anderson and Maddox run to the extraction point where Merinov should be waiting with transport, however Merinov betrays them to the serbian forces and the two of them are captured. Anderson escapes and tries to stop the Serbians from framing the US for the genocide. He then soon learns that Maddox is in league with Merinov, Anderson is then tasked with killing Maddox instead of Merinov and gets the kill shot in whilst Maddox is driving a jeep. 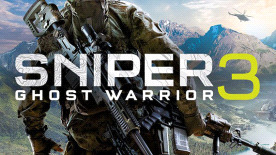 If you are not up to speed on the previous game's story then you can read up on the plot to Sniper Sniper Ghost Warrior 1.